"Uncovering Hollywood's biggest secret, will take Hollywood's biggest actors." Universal has debuted a new TV spot for the upcoming Coen Brothers film Hail, Caesar!, starring George Clooney as actor Baird Whitlock. This adds to the first TV spot and first trailer for the film, setting up a plot involving Whitlock getting kidnapped. The cast includes Josh Brolin, Ralph Fiennes, Tilda Swinton, Channing Tatum, Scarlett Johansson, Frances McDormand and Jonah Hill. In addition to the TV spot, a new poster appeared online and although it looks official, it may just be fan-made, though we've added it below anyway since it looks so cool. I'm glad we're seeing even more marketing arriving for this film, since the release is coming up soon. This new comedy from Joel & Ethan Coen is about a Hollywood fixer in the 1950s working to keep the studio's stars in line. Hail, Caesar! is both written and directed by iconic American filmmakers Joel Coen and Ethan Coen, of the films Inside Llewyn Davis, True Grit, A Serious Man, Burn After Reading, No Country for Old Men, O Brother Where Art Thou?, The Big Lebowski, Fargo, Barton Fink and Miller's Crossing. previously. "I wouldn't actually call it a 'musical comedy' — there are movies within the movie, and those movies might have comedic music, but the movie we’re making is actually not comical," composer Carter Burwell said earlier this year about the film. It premieres at the Berlin Film Festival. 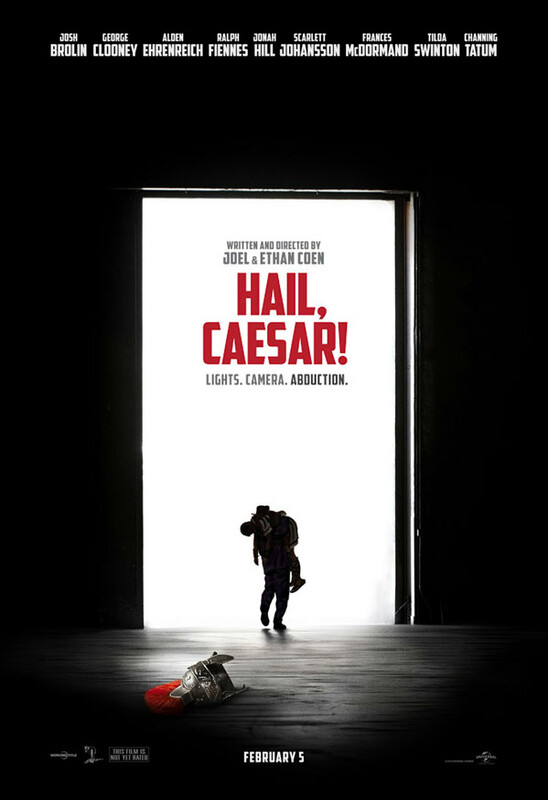 Universal will release the Coen Bros' Hail, Caesar! in limited theaters starting on February 5th, 2016 next year. You in? Terrific poster. I wonder why they chose to reference a Western flick, but it looks great, and they got a fantastic tag line. Good observation. I suspect it's because the movie takes place during the Hollywood "golden era" of Westerns and sandal pictures. That is a good poster. The Coens are just so damn good.